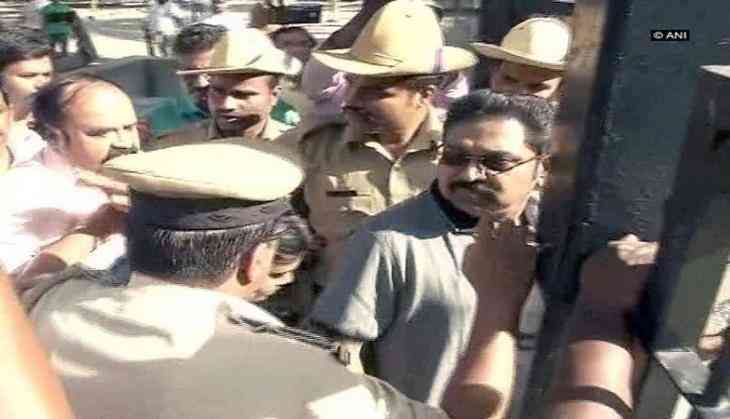 Ousted All India Anna Dravida Munnetra Kazhagam (AIADMK) deputy general secretary TTV Dinakaran on 5 June reached Bengaluru's Parappana Agrahara jail to meet party leader and General Secretary V.K. Sasikala who was jailed in February in a Disproportionate Assets (DA) case. A Delhi court on 1 June granted bail to Dinakaran and his aide Mallikarjun over allegedly bribing the Election Commission officials for the party's two leaves symbol. The Tis Hazari court granted bail to the duo on personal bond of Rs. five lakh, however, they were asked to surrender their passports. Sasikala appointed Dinakaran, her nephew, as her deputy before she went to jail to serve a four-year sentence for corruption. He was sidelined by the party as it attempted a reunion with a rebel faction led by former Tamil Nadu chief minister O. Panneerselvam or OPS, whose main condition for a merger was that Sasikala and her family be kept away from the party and the government. Dinakaran and his aide Mallikarjuna were arrested in April by the Delhi crime branch police. The duo was charged with attempting to bribe election commission officials in the AIADMK symbol row to gain a favourable verdict.